The Battle of Mesilla was a Arizonan victory at Mesilla, in Confederate States of America's Arizona Territory on July 25, 1861. 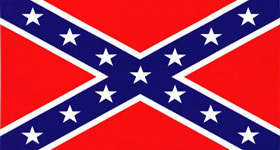 This victory paved the way for the Confederate offensive the following year. Following the secession of Texas in February 1861 and its joining the Confederacy, a battalion of the 2nd Texas Mounted Rifles under Lieutenant Colonel John R. Baylor was sent to occupy the series of forts along the western Texas frontier which had been abandoned by the Union Army. Baylor's orders from the Department of Texas commander, Colonel Earl Van Dorn, allowed him to advance into New Mexico in order to attack the Union forts along the Rio Grande if he thought the situation called for such measures. Convinced that the Union force at Fort Filmore would soon attack, Baylor decided to take the initiative and launch an attack of his own. Leaving during the night of July 23, Baylor arrived in Messilla the next night, prepared to launch a surprise attack the next morning. However, a Confederate deserter informed the fort's commander, Major Isaac Lynde, of the plans. The next day, Baylor led his battalion across the Rio Grande into Mesilla, to the cheers of the population. 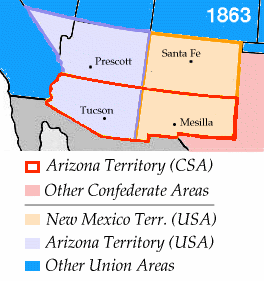 A company of Arizona Confederates joined Baylor here, and were convinced to muster into the Confederate Army. On the 25th, leaving a small force behind to guard the fort, Lynde led 380 Regulars to the village to drive out Baylor. Lynde approached the town with his command and demanded Baylor's surrender. When Baylor refused, Lynde deployed his men into a skirmish line and opened fire with his mountain howitzers. The infantry was ordered to advance but heavy sand and corn fields interfered with this attack. Lynde then ordered his cavalry (three companies of the Regiment of Mounted Rilfes) to charge Baylor's men. The Confederates managed to shoot many of the Union officers during this time, which disorganized the attack. The Union attack was repulsed, and both sides began skirmishing at long range. Lynde reformed his command but decided to retreat back to the fort, with the Confederates in pursuit. Lynde lost three men killed and two officers and four men wounded, while Baylor lost six men seriously wounded and twenty horses killed. On July 24, Lt. Col. John R. Baylor led 300 men from Fort Bliss 40 miles up the east bank of the Rio Grande to Fort Fillmore, New Mexico. With him were 2 companies of the 2nd Regiment of the Texas Mounted Rifles, a Texas light-artillery company, an El Paso County scout company, and some civilians. The Texans reached the vicinity of Fort Fillmore at night and placed themselves between the fort and its water supply at the river.